Figure 1: Expression vector for TeNT_Hc. TeNT_Hc was expressed with a C-terminal His-tag in pET22b+. TeNT_Hc=Tetanus neurotoxin (C-terminal part of the heavy chain). This part contains a coding sequence belonging to the tetanus neurotoxin. It is not responsible for the toxic properties and therefore exhibits no toxicity for humans. The source organism of this part is Clostridium tetani, an anaerobic, gram-positive bacterium causing tetanus disease. C. tetani produces two different toxins, tetanolysin and tetanospasmin. The first is responsible for damaging the heart muscle and blood components. The latter causes more prominent symptoms like hypersensitivity, increased reactions and spasms. The neurotoxin (or tetanospasmin) is composed of a heavy and a light chain. They are translated as one polypeptide of about 150 kDa and cleaved by a protease afterwards. The resulting heavy (~100 kDa) and light chain (~50kDa) are linked to each other by two disulfide bonds (Yu et al., 2011). Regarding the functions, the light chain is the toxic part of the toxin that is translocated into the neuron at the neuromuscular junction. The heavy chain’s function is to mediate this translocation. Therefore, the C-terminal part interacts with the cell membrane via specific receptors and the N-terminal part aids in the translocation process itself. In the cell, the light chain prevents the exocytosis of neurotransmitters (Rummel et al., 2003). Nonetheless, the C-terminal part of the heavy chain, which is encoded by this part, is promising in the development of second generation vaccines against the toxin itself (Yu et al., 2011). This means of course that it provokes an immune response in humans and therefore, safety requirements have to be fulfilled while working with the part, although not being pathogenic. As Yu et al. (2011) showed before, cloning the sequence into an expression vector enables overexpression of the part in Escherichia coli. In figure 1, the vector used for efficient overexpression is shown. The coding sequence of the part is fused to a C-terminal His-tag for affinity purification. E.coli C43 cells were grown in LB medium (Luria Bertani) containing amplicillin and chloramphenicol for 4 h at 37°C. The whole cell lysate as well as different steps of the purification process were analyzed by SDS-PAGE, which can be seen in figure 2. 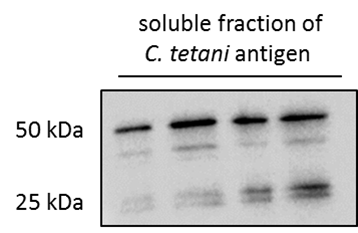 Additionally, the purified protein was used for Western Blot analysis, verifying that the antibody binding properties have been sustained (figure 3). 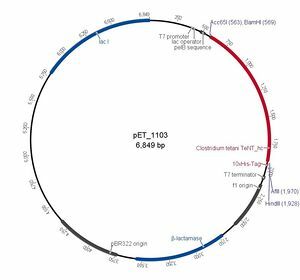 The part has been shipped to the registry in standard pSB1C3 and begins with a start codon (ATG). Cloning into the shipping backbone was performed by Gibson Assembly and the sequence was verified afterwards. Figure 3: Western Blot of His-tagged TeNT with anti-His-tag HRP Conjugate. 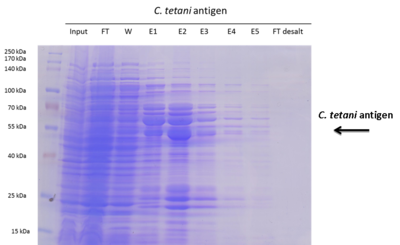 The soluble fraction of the overexpressed protein was used for this Western Blot. Anti- His Tag HRP conjugated was used in a 1:1000 dilution in blocking buffer. The expected molecular weight is 50 kDa. TeNT_Hc=Tetanus neurotoxin (C-terminal part of the heavy chain).